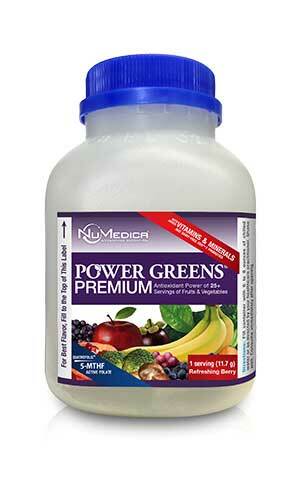 How is NuMedica Power Greens Premium Different From the Regular Power Greens? 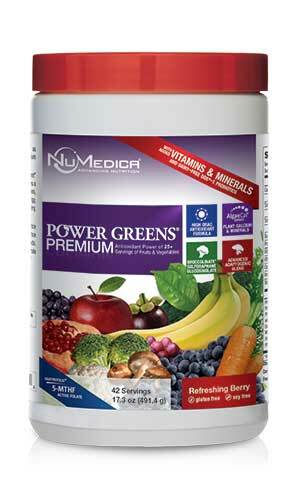 NuMedica Power Greens Premium is the "souped-up" version of NuMedica's Power Greens product line. Available in Berry flavor, this superfood drink mix includes a greater selection of SuperFoods and Phytonutrients for even more vitamins and minerals. What's a Superfood? Superfoods are known to be very rich in nutrients that are good for your health. They are mostly plant-based but may include some fish and dairy. Blueberries, salmon and kale are examples. 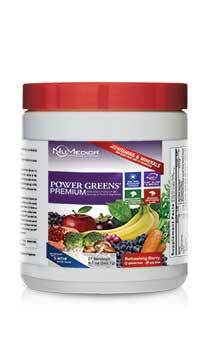 With Power Greens Premium, getting enough fruit and vegetable superfoods has never been easier! With each serving of the this premium blend, you get at least 30% of the recommended daily allowance of vitamins and minerals. 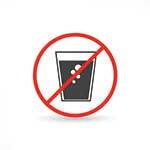 These include the active form of Vitamin B which is easier for the body to use. Power Greens Premium also includes AlgaeCal and BrocColinate. AlgaeCal is a superior, certified organic, plant-derived whole food complex supplying natural calcium and minerals. BrocColinate is an extract from broccoli sprouts that provides Phase II detoxification and provides powerful antioxidant properties. Phytonutrients are natural chemicals contained in plants that protect plants from germs, fungi, and other things. When humans eat or drink them, they help to prevent disease and keep our body working properly. 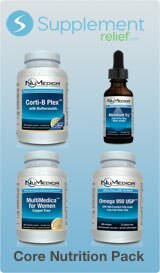 NuMedica Power Greens Premium is full of phytonutrients including pure spirulina, chlorella, certified organic goji, certified organic banana, broccoli and cauliflower. These ingredients are all naturally occurring from certified organic whole foods and plant extracts. Who among us does not feel more stressed these days? Power Greens Premium contains a full spectrum, advanced adaptogenic herb blend designed to support the body's stress response and adrenal function. It includes dairy-free probiotics for a healthier intestinal tract and 5-MTHF as an active form of folate. 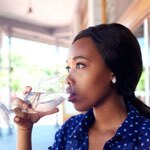 It also has a very high ORAC value, which means a very high antioxidant potential, which helps with the elimination of free radicals and slows the aging process. 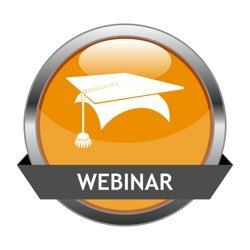 Learn more about how antioxidants help prevent disease and slow the aging process. Pick the size that works best for you. The singles are great for on-the-go, especially on your way out the door in the morning. Treat yourself better and have a Power Greens Premium single instead of that coffee or soda and see how much better you feel! Power Greens Premium Berry - 21 svg 1 Scoop 21 Add one scoop to 5-6 ounces of chilled water or beverage of your choice and stir, or as directed by your healthcare practitioner. After opening, keep refrigerated for maximum freshness. Power Greens Premium Berry - 42 svg 1 Scoop 42 Add one scoop to 5-6 ounces of chilled water or beverage of your choice and stir, or as directed by your healthcare practitioner. After opening, keep refrigerated for maximum freshness. Other Ingredients: Natural fruit flavors, citric acid, guar gum. AlgaeCal® is a trademark of AlgaeCal Distribution Inc. Patent Pending. ††As Quatrefolic® 5-MTHF. Quatrefolic® is a registered trademark of Gnosis S.p.A. Patent number 7,947,662. †Sulforaphane Glucosinolate is produced under U.S. patents: 5,725,895; 5,968,567; 6,177,122; 6,242,018; 7,303,770 and patents pending.